This is a tentative schedule, it can change at anytime!! Some classes might be outside - weather permitting! Schedule for 2017 coming soon! Here's the schedule for 2017 You can download and print. Keep in mind it can change anytime. Class descriptions are below. We’ll explore the realms of intermediate ATS® movements and performance. Presentation, consciousness and creativity will be our focus in building a well-rounded set. Adding our more complex movements, variations and performance concepts, we’ll see an evolution of our dance form unfold. Possible moves to be added: Sahra Turn + pass; Wrap Around Turn + pass; Barrel Turn + pass; Belly Rolls/Flutters; Laybacks; Bouncing Circle Step; Wet Dog; Reverse Shimmy; Egyptian Full Turn; Arabic Hiptwist Flourish & Fades; Spins. To get good, we must practice, not only on our own, but with others. This class will focus on presenting out of a chorus, creating explosive entrances and smooth exits, plus tips on how to keep formations centered and the chorus evenly spaced. This workshop is great for the intermediate to advanced dancer. Transform your ATS® performance with smooth transitions into interesting formations like Dueling Duets, Diagonals, Café Style, and using Fades to create depth and texture. Must have good technique in all moves covered in the “FUN-da-mentals!” workshop: Taxeem, Hand Floreo, Arm Undulations, Bodywave, Egyptian, Arabic, Pivot Bump/Choo Choo, and Shimmy. In this workshop, Super Beth will assist you with transforming your routine with some new movements that you can add to your ATS® set. Concepts taught in this exciting workshop include the Triple Sevillana, Shoulder Shimmy Level Drop, the CIC, the Double Back Spin, and others. Like what we had in 2014, you can choose from amongst these tried and true concepts as well: Egyptian Flip, Stella Luna, Happy Goat, and the Min Spin Combo. *Best for dancers that have firm knowledge of FCBD® Classic and Modern ATS® movements. Fans can be incorporated as a specialty or concept piece within your ATS performance set. Fans add a bit of spark and color and are an audience favorite! Super Beth will show you how to handle and hold a large dance fan, and will lead you through a series of fast steps that will showcase these colorful props. Dancers should have familiarity with the four basic movements from the FCBD Volume 1 DVD. Expect a good upper body workout! For examples of them, or to purchase them: click here. Intro to Basic Doumbek Rhythms for Everyone! Are you a dancer who wants to play the drum but doesn’t know her ayub from her elbow? A novice or beginner drummer who wants to learn the basic "hits" (doum, tek and the elusive ka?) This is the workshop for you! 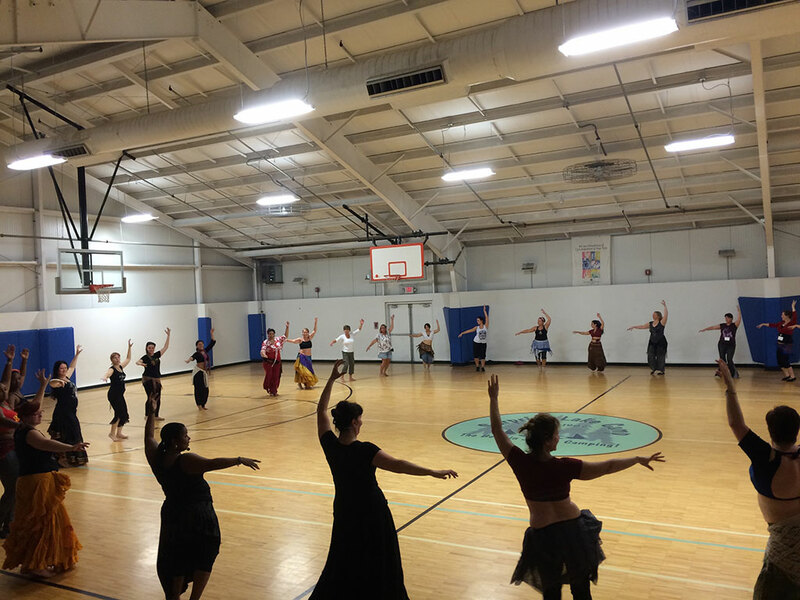 Join Casey for her fun, funky, user-friendly introduction to basic playing technique and common belly dance rhythms. Yay! No pressure, no drama…no kidding! Bring a hand drum (doumbek, frame drum) and a smile! Pick up a frame drum and let’s start playing! Dancers and novice drummers welcome, along with more experienced percussionists. Experience the joy of playing ensemble style! Learn to accompany a melody instrument, playing along to the songs “Erev Shel Shoshanim,” “Nihavent Oriental” and more. Be a dear and bring extra frame drums to share! Please note: there will be some frame drums to borrow and some inexpensive frame drums available for purchase. This drum class is designed to show how absolute beginners, intermediate drummers and beyond can learn to perform together as Raq Steady & Friends! Learn to play Casey's percussion piece “Got Your Six!” as part of a conducted percussion ensemble. Warm up with some drills- rhythm, tempo and dynamics. Yay! Everyone who attends this class is welcome to perform “Got Your Six!” with Raq Steady & Friends in the Gala Camp Show! Please bring any hand drum- bass doumbeks and frame drums especially welcome! Please note: there will be some drums to borrow and some inexpensive frame drums available for purchase. Calling all percussionists- novice, beginner, intermediate and beyond! Learn to play Casey's percussion piece (“Got Your Six!”) as part of a conducted percussion ensemble. We’ll start with a quick review of the rhythms used in the piece, then move on to a progressive rehearsal, with emphasis on ensemble techniques and skill-building. Everyone who attends this class is welcome to perform “Got Your Six!” with Raq Steady & Friends in the Gala Camp Show! Please bring any hand drum- bass doumbeks and frame drums especially welcome! Please note: there will be some drums to borrow and some inexpensive frame drums available for purchase. Learn the secrets to playing short, fun, dancer-friendly drum solos using just a few basic rhythms and some truly simple (yet effective) solo accents. Pick up some practical tips and tricks to create OMG Openings and Rock Star Endings that will highlight the strengths of your belly dancer and delight your audience! Open to all levels but novice/beginner and intermediate drummers who are nervous performing live drum solos are especially welcome. In addition to lead doumbek, bring bass doumbek and frame drums to learn supporting percussion patterns. Please note: this is not a dance class but dancers are welcome! Curious about stepping outside of 2/4, 4/4, and 8/4 rhythms? This workshop will discuss how to construct odd rhythms and phrases, show off some of the cool odd rhythms that we can work with, and learn how to layer odd phrases into even meters! Bring an open mind, and your math hat! Have you heard the old adage “Practice Makes Perfect”? Think again! In order to truly benefit from practice, it needs to be accurate, focused, and tracked! In this workshop, I’ll show you how to zone in on a specific aspect of your playing, get the most benefit for your time, and track your progress to stay motivated! I’ll also show you some drills that I use and some tools to design your own focused drills! Do you find yourself getting tired after just a few maksums? Are those multi-hour haflas wearing out your hands? Not any more!! This workshop will explore both physical and mental endurance in general, and show you how to work endurance drills into your practice routine! Dance classes - prior knowledge is recommended but not required as we will have some beginner classes. Drum classes - We'll have drums to loan, but please BYOD (bring your own drums). Beginners are welcome, but knowledge of the basic hits and rhythms is needed for the more advanced classes. 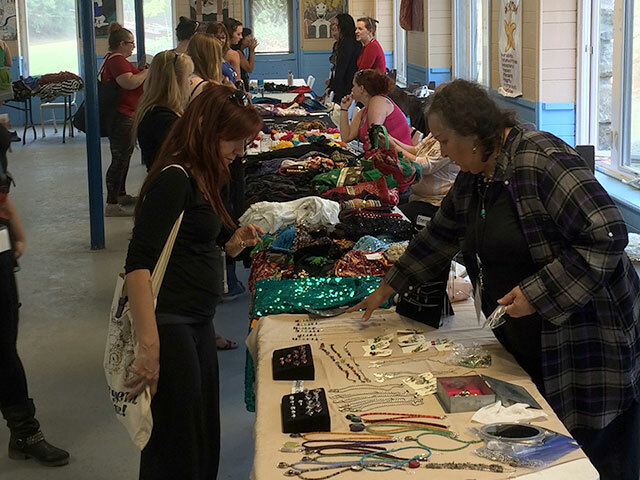 Swap Meet - Items should be new or gently used, and belly dance related. This is not a vending opportunity, so please, no mass quantities of goods. One-of-a-kind items: flowers, jewelry, choli's, skirts, Melo's, DVDs, CDs, etc are all fine. You are responsible for your own goods and transactions - please bring small bills to make change. Please bring a tablecloth or veil to cover your space (optional), and please tag anything you'd like to swap or sell with a price, your name & your email or phone number (not optional ) If anything gets lost, we want to be able to locate you. Dance classes are in a huge 10,000 sq. ft gorgeous gym! 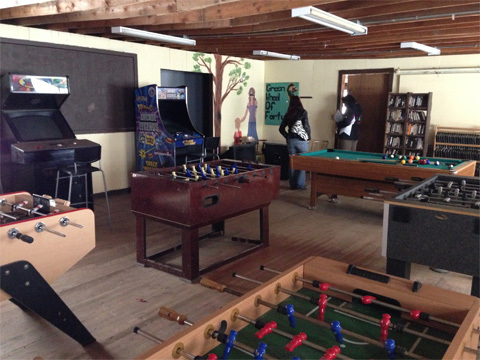 Take a break with foosball, pool or games.